TOP PHOTOS: Minty marshmallow marvels for Christmas snacking. BOTTOM PHOTO: Buying peppermint candy crunch saves you the time of trying to evenly crush whole peppermints or candy canes. Photo courtesy King Arthur Flour. Photos courtesy King Arthur Flour. To bring to a party or for homemade gifts, marshmallows are a delightful alternative to cookies. This holiday, from King Arthur Flour, pack lots of peppermint in every bite. Prep time is 20 minutes to 30 minutes, cook time is 10 minutes to 15 minutes. Marshmallows are best made a day in advance, so they can set in the pan before cutting. Here are step-by-step photos. 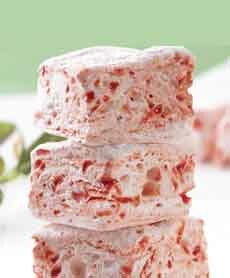 Here’s another recipe for no-crunch Green Peppermint Marshmallows. 1. COMBINE the gelatin and 1/2 cup of the cool water in the bowl of an electric mixer fitted with a whisk attachment. Set the bowl aside. Grease a 9″ x 13″ pan (glass or ceramic is best) and a dough scraper, and set both aside. 2. COMBINE the sugar, corn syrup, salt and the remaining 1/2 cup cool water in a small, deep saucepan. Cook the mixture over medium heat, stirring until the sugar dissolves. Raise the heat to high and cook, without stirring, until the syrup reaches 238°F to 240°F on a candy or digital thermometer. Remove from the heat. 4. 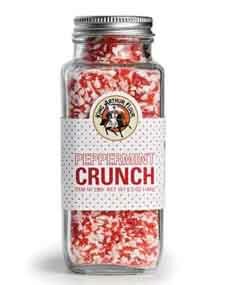 ADD the peppermint crunch and red gel paste, and mix just until you can see swirls of red and white. Spread the marshmallow into the greased pan with the greased dough scraper. 5. WET your fingers and use them to smooth and flatten the marshmallow in the pan. Sprinkle the glazing sugar or confectioners’ sugar over the top, and let sit for several hours (or overnight) before cutting. 6. USE a greased knife or cookie cutters to make squares or other shapes. You can cut about two dozen 2″ marshmallows or eight dozen 1″ marshmallows (we prefer the larger size for visual impact). 7. WRAP the marshmallows airtight in plastic. They can be stored for several days at room temperature.